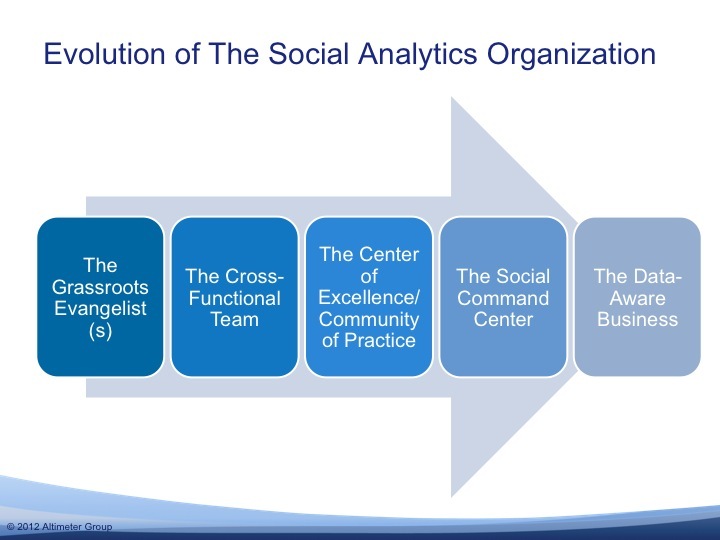 How Will the Social Analytics Organization Evolve? My colleague Jeremiah Owyang has done a great deal of work to research and propose a framework to design the social organization. You can find his thinking on this subject on his blog, Web Strategy and via his research reports. The (Big) Data-Aware Organization. I’d be remiss if I didn’t acknowledge what should be at the top of this list; the integrated measurement organization that looks not only at social data but at data in aggregate across the business. This organization–which by the way does not yet actually exist–will collect, analyze and interpret social, sales, operational, supply chain, industry and other enterprise data and use it to sense, respond to and even anticipate changes in the business. This is not to discount the need for nailing an organizational model for social analytics; it’s simply to acknowledge that social is only one dimension of the truly data-aware business. The Social Media Command Center. This is still a relatively rare breed, but the most well-known examples are Dell’s Social Media Listening Command Center and Gatorade’s (PepsiCo’s) Mission Control. Both these centers are state-of-the-art, required significant corporate commitment and investment and were conceived for a range of functions, from listening to customer response and support. Gatorade’s Mission Control has the additional, explicit charter to measure the performance of campaigns and social media initiatives. They demonstrate commitment to ongoing dialog with customers and community, as well as to organizational learning, but it’s not yet clear whether this will remain a noble experiment, become a widely adopted model, or morph into something else entirely. The Cross-Functional Team. Not quite empowered (generally meaning funded) at a comparable level as a CoP or COE, the cross-functional team is usually the first step toward creating a more holistic social media measurement capability. Typically, this team is comprised of marketers, social media specialists, market research and web analytics team members, as well as representatives from other lines of business (sometimes even vendors and agencies). To reach the next level (CoP or COE), this team must effectively construct a business case for further investment that demonstrates the insights and value they’ve been able to deliver, and the benefits of chartering them as an “official” function within the business. The grassroots measurement evangelist(s). This is typically one or a few folks who see the need for a more holistic approach to social analytics, and are intent on (sometimes even fanatical about) demonstrating the need for this function to management, peers and anyone else who will listen. I know a number of people who fall into this category because they deeply understand the need for a holistic approach to social analytics and are therefore ready and willing to build their business case for more investment so they can operationalize the practice of social media measurement throughout the business. In the coming months, I’ll be conducting deeper research on this topic, and would welcome your insights. What are you seeing as emerging best practices and evidence of the evolution of social analytics within your business? Please feel free to post your thoughts (and of course any additional examples) in the comments. This entry was posted in Predictive Analytics, Research, Social Analytics, Social media, Social media measurement and tagged Social Organization. Bookmark the permalink. 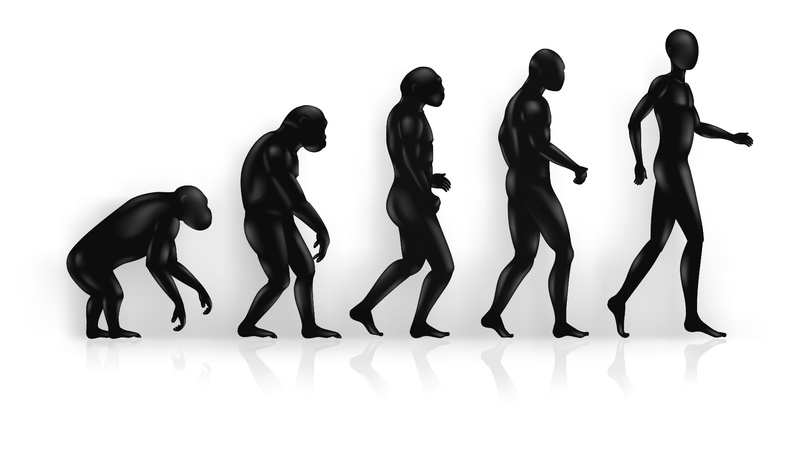 5 Responses to How Will the Social Analytics Organization Evolve?